In part one of this article, we introduced some helpful fixes that will make your laundry room a more work friendly space. 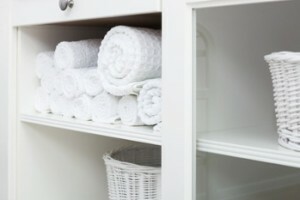 Now, we’ll go into a little detail on choosing cabinets and storage options for your laundry room makeover. Style – The laundry room does not have to be a “closed door” room off to the side to be ignored. It can be an extension of your style. If your kitchen is full of maple cabinets, you can continue that into your laundry room by adding maple there as well. Or, you can choose to go a whole different route. Durability – A good rule of thumb is to choose the same types of cabinets you would for a bathroom; they must be able to endure water and moisture, along with much wear and tear. If you opt for wood cabinets, make sure to coat them with either a moisture-resistant primer before painting, or a wood sealant (if they are already painted). Laminate cabinets are a great option too – not only are they waterproof, but also very durable, easy to keep clean, and available in many colors. Safety – The space above the washer and dryer is a great area to store your laundry detergents, chemicals, dryer sheets, etc., especially if there are small children in your home. Organization– Make sure you use your laundry room to its full potential by adding as many storage shelves, cabinets and drawers as possible. This give you a place to store all the items you want to keep out of sight (even if they have nothing to do with laundry…shoes, crafts, pet food, etc.). If you really want to, you can even keep your washer and dryer out of sight by adding bi-fold doors or sliding doors to close when they are not in use. When it comes to your laundry room, there are so many possibilities. Why waste any space in your home when you could turn it into a storage haven and fun place to be? After all, laundry is a never ending story…wouldn’t you rather that story be an interesting one? If you’d like to learn more, find a cabinet dealer in your area, and they’ll be more than happy to run ideas by you.